Geoff Bickerton has some thoughts about the democratic implications of the deal between the CAW and Magna. The Canadian Peace Alliance has a few things to say about the recent poll (trumpeted by the Globe and La Presse) that ostensively shows Afghans supporting the occupation. RadicalCartography.net has a lot of cool maps, including this complete map of US territories around the world. "a simple message of resistance"
Has anyone seen "a simple message of resistance", a video apparently (?) put out by a group called the "Islamic Jihad Army"? It has apparently been around for quite a while (Jan 06), but I'm behind the times, it would seem. There's also this, which is more recent. I have no idea as to its authenticity, but I've never seen this kind of direct, targeted video propaganda from guerrillas before--I'm not even sure the Zapatistas did anything like this with video--at least not in English. Regardless of its origin, that makes it interesting as an attempt to bypass the media and speak to people directly. Update: There's this, but I haven't found much in the way of commentary. Editor and Publisher has an interesting piece about the anti-union stance of newspapers that publish in union towns like Detroit. As anticipated in the photo essay about Algonquin resistance to uranium mining on their land, members of the Ardoch and Shabot Obaadjiwan Algonquin Nations canoed to Ottawa to protest the planned uranium mines on Parliament Hill and demonstrate that the waters connect planned mines with downtown Ottawa. 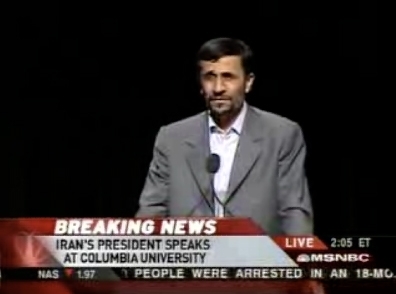 You can see videos of Ahmadinejad's speech and Colombia University President Lee Bollinger's opening remarks. Without any apparent sense of irony, Bollinger calls on the Iranian President to allow an American who is being held without trial in Iran to be allowed to leave, just to cite one example of the bizarre double standard that is, well, standard in the US right now. It's probably standard everywhere, but in any case, it's embarrassing to watch intelligent people talk like this. Ahmadinejad was in New York today, as some of you may have noticed. 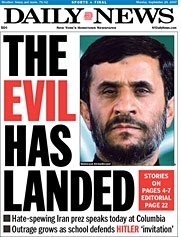 I'm sure many Iranians (as well as the entire US elite) will tell you that he is pure evil. But as of the last election, they are still in the minority. This may have something to do with his blend of appealing to Islamic "values voters" and the poor ("putting the petroleum income on people's tables" was apparently one of his campaign slogans). He's a religious nut, but not much more so than George W, as far as I can tell. There's plenty to dislike about the Islamic Revolution--violence, suppression of rights, theocracy, and so on. (That said, the revolution was a reaction to the Shah, who killed his way to power with US help, replacing a democratic, secular government that wanted control over their own oil.) To an extent, Ahmadinejad can be said to represent the results of this theocracy. That said, let's be serious. Maybe, just maybe we can put to rest the references to "Mahmoud Ahmadinejad, who denies the Holocaust ever happened and seems quite happy at the thought of unleashing nukes against the Jews" (as Margaret Wente put it in her absurdly high-profile Globe column on Saturday). Hopefully the fact that Ahmadinejad repudiated claims that he said these things (not that there was a lack of evidence before) will put this line of thinking to rest. » continue reading "Ahmadinejad should be criticized, but let it be about things he has actually said"
A new study says high-income Canadians got a lot richer between 1992 and 2004, while the rest of the population made little financial progress. The Statistics Canada study, which used tax returns to explore trends among high-income earners, found the top five per cent of the tax-filing population accounted for about 21 per cent of total income in 1992; by 2004 it accounted for 25 per cent. The study found little improvement among the rest of the population and it says that while there were more high-income earners who were women in 2004, their share of the pie was depleted. Three-quarters of the 1.2 million high-income Canadians were men, even though men were a minority (48 per cent) of individual income recipients in general. The rise in value of the Canadian dollar "is an energy story," said Busch. With crude oil futures trading at more than $83 U.S., investment capital is pouring north to help extract oil from so-called tar sands, also known as oil sands, in the province of Alberta. "Her specific exposes across six decades of infamy are often excellent, but in her larger ambitions her metaphors betray her." You have to read to the end of Alexander Cockburn's review of Naomi Klein's The Shock Doctrine to find that line, which summarizes the case he makes in the preceding pages. Which is, I think, intuitive, though I haven't read the whole thing: Klein's is good journalism, but "shock doctrine" is too tidy to be a lasting theoretical contribution. As a slogan, though, it's brilliant. ...by the right wing of America's young elite, visit this link. One by one, protesters stood up to interrupt recently appointed foreign minister Maxime Bernier during a speech urging support for the occupation of Afghanistan. 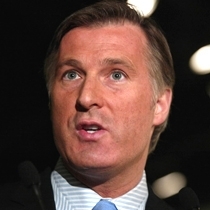 Press accounts in both French and English called it a "baptism of fire" for Bernier. Toronto Star correspondent Allan Woods couldn't make the drive from Ottawa, and ended up publishing quotes from the transcript that was sent to him. He probably got home early enough to watch it on TV. According to this story, it appears that a group of Navajo were detained without a warrant or arrest by the RCMP using antiterrorism legislation. were on their way to Deseronto in nine vehicles with 10 horses in tow to show support and respect for a group of Tyendinaga Mohawks, said Spata Desareau, 64, a member of the tribe. They travelled across western Canada without incident, but once in Ontario, were stopped by law enforcement three times - Wawa, Sault St. Marie and finally Kaladar, where they were taken into police custody Sunday, he said. So, the conventional spin is that the Liberal lost all three by elections in Quebec today, including the "Liberal stronghold" of Outremont, and oh what a disaster for Stéphane Dion. 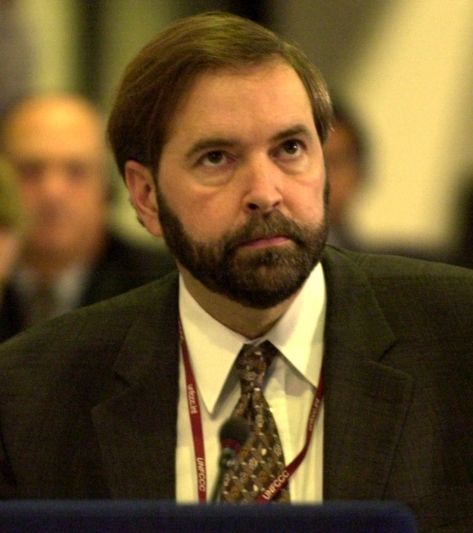 The key challenge for the NDP will be to keep Mulcair from crossing the floor to the Liberals when they recover in the polls. That, or take the Liberal Party's place by becoming cynically opportunistic by running from the left and governing from the right. Cynics will note that despite the fact that the anti-war vote contributed to Mulcair's victory, the fact that the Liberal Party is weak in Quebec is apparently likely to have the opposite effect on actual policy when it comes to Afghanistan. Believers in party politics will tell you that Quebec now has a strong progressive voice in the house of commons, who will pressure the government to withdraw from Afghanistan and fulfill Kyoto obligations. But he surely won't be to blame if troops remain in Afghanistan, and greenhouse gas emissions and the extractive industries that drive them remain undeterred. T-Star: Right to Self-Determination "Troubling," "Worrisome"
Toronto Star Editorial: "Particularly troubling is the 'right to self-determination' in article 3. Notwithstanding last-minute changes to the declaration that purport to protect the territorial integrity of existing states, could this phrase go beyond encouraging legitimate aspirations for native self-government and empower full-blown secessionist movements? Based on the declaration, it's hard to tell. That's worrisome." Back in 2005, I wrote a review of an art exhibit about skateboarding as a critique of architecture. In the artwork and the narrative that accompanies it, the exhibit is unabashedly theory-driven. In the large-type wall mounted introduction, curator Anthony Kiendl proposes that skateboarding can be the basis of a "critique of architecture, social spaces, and the values constituted by those spaces." Further comments displayed on the walls alongside the artwork by architectural historian Iain Borden (among others) speak of "movement of the body across social space", of skateboarding as "a reassessment of the values of society as expressed through the reappropriation of social space," or as a kind of "performative language". [...] A discussion of the skateboarder as flâneur invokes Baudelaire and Benjamin, among others. Like the young men of 19th century Paris celebrated by urban critics and poets of the time, skateboarders are not only a part of the cityscape, but a critical, aloof, self-conscious force within it. » continue reading "Skateboarding, Parkour and Architecture"
You may have heard that the United Nations recently passed the Declaration on the Rights of Indigenous Peoples. You may have also heard that only four countries voted against it. Any guesses? » continue reading "Universal Declaration on the Rights of Indigenous Peoples Passed..."
Murray Dobbin has a fun piece where he compares Tom D'Aquino of the Canadian Council of Chief Executives to Iran's Grand Ayatollah. The role, it turns out, is not dissimilar. The WSWS had a great little analysis of the media coverage surrounding Michael Vick. And their interview with Cindy Sheehan is worth a second look, too. "similar to injecting a big rat with crystal meth, then throwing it into a roomful of feral cats"
Stan Goff tries to introduce the "netroots" to the idea of orientalism, and then suggest that they might be participating in that. I just wanted to write to let you know that the 10,000 petitions you delivered with great fanfare to the gates of the Chateau Montebello last week are safe. You know, the ones in the three clear plastic bins with the blue lids. The ones featured in that photo on your website ( www.canadians.org). » continue reading "Letter to Council of Canadians"
We are urging for the safe return of Lovinsky Pierre-Antoine. Our international human rights delegation seeks the safe return of Lovinsky Pierre Antoine. A long-time defender of human rights and advocate of the poor, Lovinsky Pierre Antoine has not been seen since 10:00 pm Sunday, August 12, 2007. Our delegation has made numerous attempts to contact him but thus far has been unsuccessful. » continue reading "We are urging for the safe return of Lovinsky Pierre-Antoine." 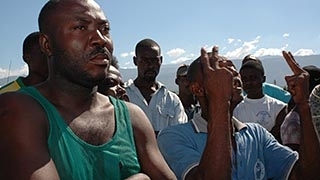 Roger Annis is in Haiti, posting regular reports on human rights issues on the Toronto Haiti Action Committee web site. Ahni at Intercontinental Cry has this month's roundup of coverage of indigenous struggles around the world.